The confirmation box presented below confirms burying the vias. On clicking YES opens another dialog box. 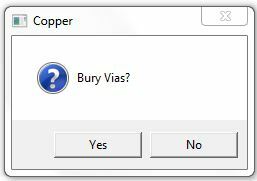 If bury vias are not found, system issues an appropriate error message. The dialog box displayed below presents information regarding the bury vias in the current project(database). This dialog may be invoked by selecting the menu Info --> Buried Vias. Given below is a brief description of the options provided in the above window. The first column gives the information of all 32 layers used in the system. The rest of the columns represented by numbers provides information regarding the number of bury vias used in the project(database). 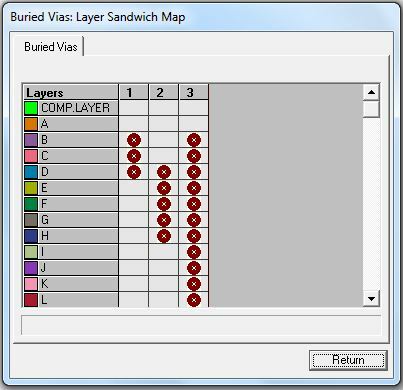 The cross mark in the spreadsheet gives information of the layers that is connected by these vias.